Managers As Mentors is a rapid-fire read and a provocative guide to helping associates grow and adapt in today’s tumultuous organizations. This new edition has been thoroughly revised and updated. 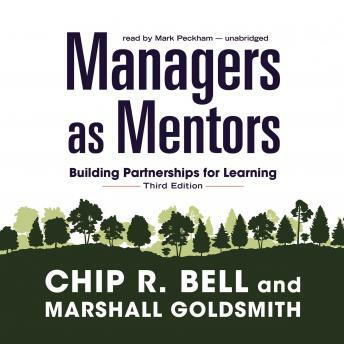 Chip Bell and Marshall Goldsmith place increased emphasis on the mentor as a learning catalyst for the protégé rather than someone who simply hands down knowledge—crucial for younger workers who prize growth opportunities even more than prior generations and who tend to distrust hierarchy. As with previous editions there is a fictional case study of a mentor-protégé relationship running through the book, but this is augmented with six actual case studies of top CEOs from organizations like The Nature Conservancy and Bloomin’ Brands, who relate key mentoring experiences in their lives. The new chapters cover topics like the role of mentoring in spurring innovation and mentoring a diverse and dispersed workforce accustomed to interacting and getting information digitally. Also new to this edition is the Mentor’s Toolkit, six resources to help in developing the mentor-protégé relationship. This hands-on guide takes the mystery out of effective mentoring, teaching leaders to be the kind of confident coaches integral to learning organizations.